A quick guide to Poulenc's powerful opera. Frightened by life and by growing rumours of revolution, the aristocratic Blanche de la Force takes refuge in a convent and becomes a Carmelite nun. But, as the French Revolution grows more savage, it seems that the convent will provide no refuge for Blanche – or her fellow nuns. Dialogues des Carmélites is based on a true story, recorded by Sister Marie of the Incarnation (Mother Marie in the opera), who survived the French Revolution. Sister Marie’s account was used as the basis for a 1931 novel by the German writer Gertrud von Le Fort. Le Fort invented the character of Blanche de la Force, with whom she identified. In the 1940s Le Fort’s novel was made into a stage play (originally a filmscript) by the French writer Georges Bernanos, who was particularly fascinated by the death of the old Prioress. Poulenc based his libretto closely on Bernanos’ text. Poulenc wrote in the dedication of Dialogues des Carmélites that many great past opera composers had influenced the opera, including Monteverdi, Musorgsky, Verdi and Debussy. He modelled all-five principal characters on past operatic heroines, including Thaïs (Blanche), Zerlina (Constance) and Desdemona (Madame Lidoine). Poulenc’s devout religious faith is shown in the beautifully simple music of the Carmelites’ prayers, including the devastating ‘Salve regina’, sung by the nuns as they are martyred. Dialogues des Carmélites had its UK premiere at Covent Garden in 1958, with a cast including Joan Sutherland (Madame Lidoine). The opera was revived here in 1959 and 1963 and was last seen at Covent Garden in 1983, when the cast included Felicity Lott (Blanche). Robert Carsen’s simply staged production allows the humanity of Poulenc’s characters to speak. Subtle contrasts in lighting reflect the characters’ emotions and the progress of the drama, while the costumes suggest the troubled period in which the opera is set. Carsen avoids melodrama at all times, particularly in the opera’s climactic final scene. 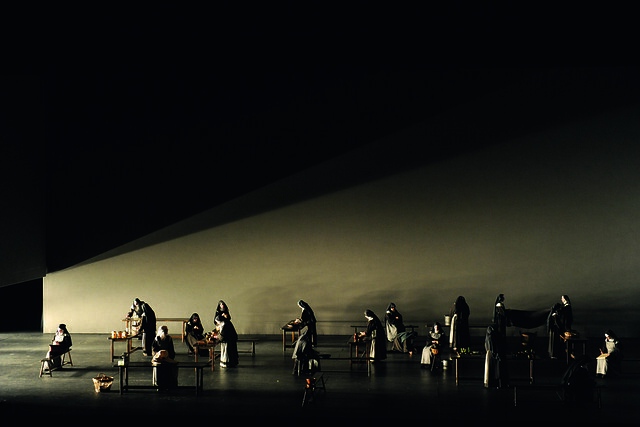 Dialogues des Carmélites runs from 29 May–11 June 2014. Tickets are still available. The production, originally from De Nederlandse Opera, Amsterdam, is given with generous philanthropic support from Mrs Aline Foriel-Destezet, The Taylor Family Foundation and The Calouste Gulbenkian Foundation. This is a most helpful guide. A relief to hear this is to be a 'simple' production. Thank you.